Taking care of your vehicle’s brakes is an essential part of maintenance and car safety. 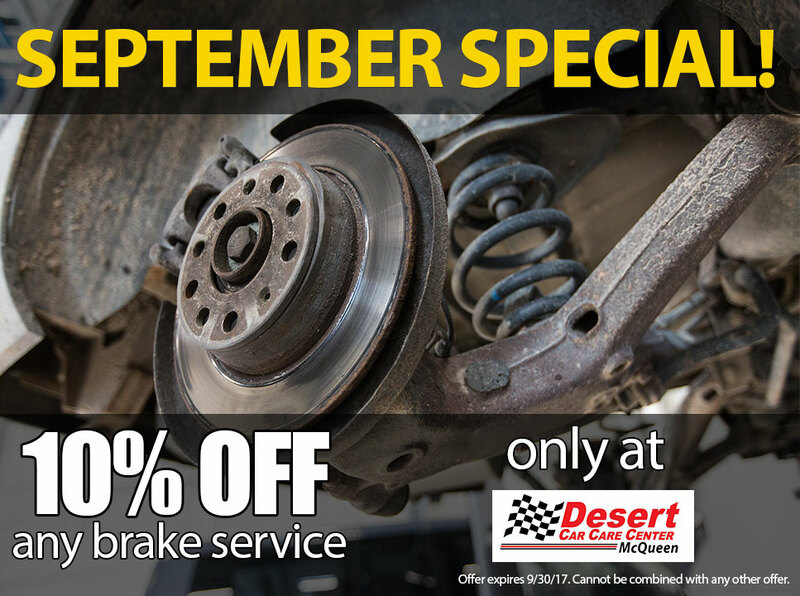 Here at Desert Car Care McQueen in Gilbert, we offer free brake inspections and will be happy to check the condition of your braking system when doing other maintenance or repairs for your car. At the very least, brakes should be checked by a qualified auto technician at least once a year. We suggest always inspecting brakes when having tires rotated. A complete brake check includes looking at the brake pads and linings for wear, the levels of your brake fluid, the thickness of brake rotors, the condition of your hoses and brake lines, your brake lights, and the dashboard warning light that alerts you to issues with your brakes. Let’s break that down into what each part of the brake system is, what it does, and how to tell if it is getting worn out. If you’re a novice to car care, you might not know what any of these are. If you’ve ever ridden a bicycle with hand brakes, it will help in understanding how vehicle brakes work. On a bicycle, two rubber pads are placed just outside the tires of the bike. When the rider squeezes the hand brake, the pads come together on the rubber of the tire, creating friction, and slowing the bicycle. It works the same way in vehicles, except the pads are much sturdier and thicker. But they do become worn over time and will need replaced about every 50,000 miles. That number can vary greatly depending on how often the driver applies the brakes. Here is a brand-new brake pad, and an old one in which the padding is all worn off. Besides visually checking the pads and the rotors (the disc that the brake pads squeeze to stop a car), drivers should listen for screeching sounds, which could mean the padding is nearly gone and the metal part of the brake shoe is rubbing against the rotor. The makers of brake pads deliberately include a small piece of metal under the layers of rubber padding so that when the padding wears down, the metal on metal screech will alert drivers that immediate maintenance is needed. 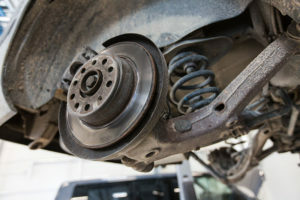 If drivers ignore the sound, the metal brakes can severely damage the rotors, which becomes a more expensive repair than routinely replacing worn pads. Rotors that have deep grooves and scratches on them will need to be replaced. If your car shimmies or pulls to one side when you apply the brakes, this is another indicator that it is probably time for brake work. Also, if you must pump hard to get your brakes to catch, your brake fluid may be low or dirty. Brakes are vitally important to driving under all road conditions, and equally important to motorist safety. Take the time to have your brakes routinely inspected to ensure safety, and to avoid costly repairs.